After slowly and successfully shrugging off its undeniable iron and steel industrial past, Pittsburgh has emerged as a city of beauty and culture, being filled with world-class universities, attractive riverfront neighborhoods and much ethnic diversity. Pittsburgh is located at the confluence of both the Allegheny and Monongahela rivers, adding further to its tourist appeal and forming an important central district, known as the 'Golden Triangle', which is overlooked by Mount Washington and its popular funicular railway - the Monongahela Incline. Few would believe that Pittsburgh actually boasts more bridges than the Italian city of Venice, but being home to almost 450 different bridges, this strange fact really is quite true. However, there are only seven large bridges of note in the city center, each with their own footpath. For tourism, the downtown Pittsburgh Convention and Visitors Bureau offers plenty of useful tourist information and lies within the Golden Triangle area, on Liberty Avenue and close to both 6th Avenue and Grant Street. 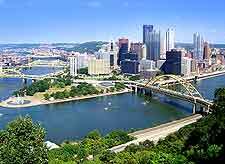 Within the city of Pittsburgh, the tourist attractions are of a very high quality and offer everything that you could possibly expect, and then some. Guided tours come in the form of trolley buses, and also amphibious 'Duckboats' - a boat-like bus which first heads around the downtown district, before driving into the river and sailing taking its passengers for a pleasant cruise. If you are here with children, then many different options present themselves. 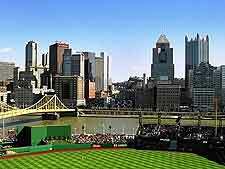 These include the Pittsburgh Zoo and PPG Aquarium, the National Aviary, the simply massive Heinz Field baseball park, and the Sandcastle Waterpark, which provides the perfect way to cool down in hot weather. 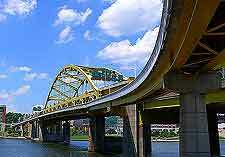 More information about Pittsburgh Tourist Attractions. 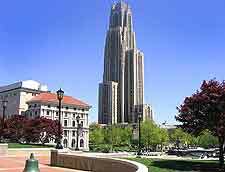 Within the city, the University of Pittsburgh dates as far back as the late 18th century and is where you will encounter some of the city's most important landmarks. The university campus contains not only the Allegheny Observatory, but the Cathedral of Learning, a skyscraper-like structure which towers high into the sky and dominates the area for miles. Other landmarks of note around Pittsburgh include the Allegheny County Courthouse, the City County Building, the Colonial Trust Building, and nearby, the Hartwood Acres Park and its Tudor-like mansion. More information about Pittsburgh Landmarks and Monuments. Pittsburgh may be a 'City of Bridges', but it is also without question a 'City of Museums', which provide information about the city's long and rich heritage. The Carnegie Museum of Natural History is one of the best and you can easily fill an entire afternoon here, looking at the dinosaur fossils and the animal-related exhibits, and still have plenty left to see. Both the Carnegie Science Center and the Pittsburgh Children's Museum also come recommended, as do the much celebrated art galleries that are the Andy Warhol Museum and the Carnegie Museum of Art. 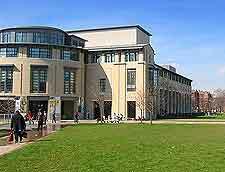 More information about Pittsburgh Museums and Pittsburgh Art Galleries. Should you choose to venture outside of Pittsburgh, a number of possible day trips immediately present themselves. The Kennywood Amusement Park at West Miffin is both close and extremely popular, with fast rides, lots of thrilling roller coasters and plenty of live entertainment. Many tourists choose to visit the architectural masterpieces of Frank Lloyd Wright, on the northern side of Ohiopyle Park. Also close to Pittsburgh is the Seven Springs Mountain Resort and the city of Canton, while further afield, both Cleveland and Columbus, in Ohio, are within driving distance. More information about Pittsburgh Attractions Nearby.